The solutions to these first 2 puzzles share a common theme, sacrificing a piece to allow the pawn through to queen. 1 Ng7+! 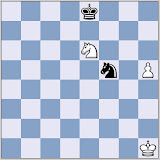 Nxg7; 2 h6 and not only can the knight not stop the pawn, but it also prevents it's own king from helping. 1 Bd5! 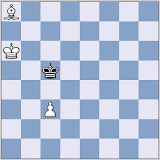 Kxd5; 2 Kb5 with a winning king and pawn ending. Here the bishop sacrifice deflected the Black king, allowing the White king into the crucial b5 square. Unfortunately the first loses: 1 ... Kf7; 2 Nd3 Kf8; 3 Ne5 and the king can't return to f7, so White escapes from the corner and wins. However, 1 ... Kf8 draws, e.g. 2 Nd3 Kf7; 3 Ne5+ Kf8; 4 Ng6+ Kf7 and White can't force the Black king away from f7/f8. 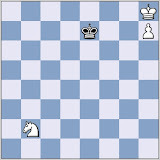 This solution relies on the fact that a knight by itself cannot 'lose a move'. The rule is, put your king on same colour square as the knight (i.e. if the knight is on a light square go to f7, if it is on a dark square go to f8). Go salvage some half points! These positions were all taken from Averbakh's Chess Endings: Essential Knowledge.